Dome of the Rock as viewed from Mount Scopus and showing the walls of the Old City. The Dome of the Rock (Arabic: مسجد قبة الصخرة, transliteration: Masjid Qubbat As-Sakhrah) is a Islamic shrine in Jerusalem. It is on the Temple Mount in the Old City. It was built from 691 from 692 by Caliph Abd al-Malik. 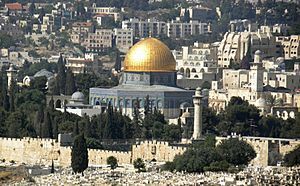 It is built on the spot where the Jewish Temple is believed to have been, and where Muslims believe Muhammad went up to heaven. The Dome of the Rock is situated in the center of the Temple Mount, the site of the Temple of Solomon and the Jewish Second Temple, which had been greatly expanded under Herod the Great in the 1st century BCE. 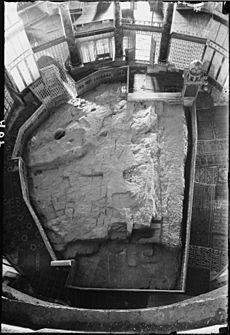 Herod's Temple was destroyed in 70 CE by the Romans, and after the Bar Kokhba revolt in 135 CE, a Roman temple to Jupiter Capitolinus was built at the site. Jerusalem was ruled by the Christian Byzantine Empire throughout the 4th to 6th centuries. During this time, Christian pilgrimage to Jerusalem began to develop. The Church of the Holy Sepulchre was built under Constantine in the 320s, but the Temple Mount was left undeveloped after a failed project of restoration of the temple under Julian the Apostate. The Dome of the Rock is now mostly assumed to have been built by the order of Umayyad Caliph Abd al-Malik and his son and successor Al-Walid I. According to Sibt ibn al-Jawzi, construction started in 687. Construction cost was reportedly seven times the yearly tax income of Egypt. A dedicatory inscription in Kufic script is preserved inside the dome. The date is recorded as AH 72 (691/2 CE), the year historians believe the construction of the original Dome was completed. In this inscription, the name of al-Malik was deleted and replaced by the name of Abbasid caliph Al-Ma'mun. This alteration of the original inscription was first noted by Melchior de Vogüé in 1864. 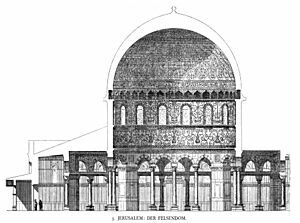 Some scholars have suggested that the dome was added to an existing building, built either by Muawiyah I (r. 661–680), or indeed a Byzantine building dating to before the Muslim conquest, built under Heraclius (r. 610–641). The structure was basically octagonal. It comprised a wooden dome, approximately 20 m (66 ft) in diameter, which was mounted on an elevated drum consisting of a circle of 16 piers and columns. Surrounding this circle was an octagonal arcade of 24 piers and columns. The original construction was surrounded by open arcades, like the Dome of the Chain. Under Abbasid caliph Al-Ma'mun (r. 813–833), an octagonal wall was added. For centuries Christian pilgrims were able to come and experience the Temple Mount, but escalating violence against pilgrims to Jerusalem (Al-Hakim bi-Amr Allah, who ordered the destruction of the Holy Sepulchre, was an example) instigated the Crusades. The Crusaders captured Jerusalem in 1099 and the Dome of the Rock was given to the Augustinians, who turned it into a church, while the Al-Aqsa Mosque became a royal palace. The Knights Templar, active from c. 1119, identified the Dome of the Rock as the site of the Temple of Solomon and set up their headquarters in the Al-Aqsa Mosque adjacent to the Dome for much of the 12th century. 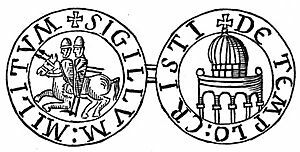 The Templum Domini, as they called the Dome of the Rock, featured on the official seals of the Order's Grand Masters (such as Everard des Barres and Renaud de Vichiers), and soon became the architectural model for round Templar churches across Europe. The Dome of the Rock was the focus of extensive royal patronage by the sultans during the Mamluk period, which lasted from 1250 until 1510. During the reign of Suleiman the Magnificent (1520–1566) the exterior of the Dome of the Rock was covered with tiles. This work took seven years. The interior of the dome is lavishly decorated with mosaic, faience and marble, much of which was added several centuries after its completion. It also contains Qur'anic inscriptions. Surah Ya Sin (the "Heart of the Quran") is inscribed across the top of the tile work and was commissioned in the 16th century by Suleiman the Magnificent. Al-Isra, the Surah 17 which tells the story of the Isra or Night Journey, is inscribed above this. Adjacent to the Dome of the Rock, the Ottomans built the free-standing Dome of the Prophet in 1620. Large-scale renovation was undertaken during the reign of Mahmud II in 1817. Haj Amin al-Husseini, appointed Grand Mufti by the British during the 1917 mandate of Palestine, along with Yaqub al-Ghusayn, implemented the restoration of the Dome of the Rock and the Al-Aqsa Mosque in Jerusalem. The Dome of the Rock was badly shaken during the 11 July 1927 Jericho earthquake, damaging many of the repairs that had taken place over previous years. The reverse of a 1000-rials banknote from 1982. In 1993, the golden dome covering was refurbished following a donation of USD 8.2 million by King Hussein of Jordan who sold one of his houses in London to fund the 80 kilograms of gold required. 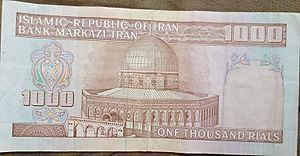 The Dome of the Rock is depicted on the reverse of the Iranian 1000 rials banknote. 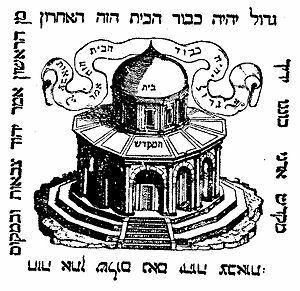 Groups such as the Temple Mount and Eretz Yisrael Faithful Movement wish to relocate the Dome to Mecca and replace it with a Third Temple. Many Israelis are ambivalent about the Movement's wishes. Some religious Jews, following rabbinic teaching, believe that the Temple should only be rebuilt in the messianic era, and that it would be presumptuous of people to force God's hand. However, some Evangelical Christians consider rebuilding of the Temple to be a prerequisite to Armageddon and the Second Coming. Jeremy Gimpel, a US-born candidate for Habayit Hayehudi in the 2013 Israeli elections, caused a controversy when he was recorded telling a Fellowship Church evangelical group in Florida in 2011 to imagine the incredible experience that would follow were the Dome to be destroyed. All Christians would be immediately transported to Israel, he opined. Dome of the Rock Facts for Kids. Kiddle Encyclopedia.